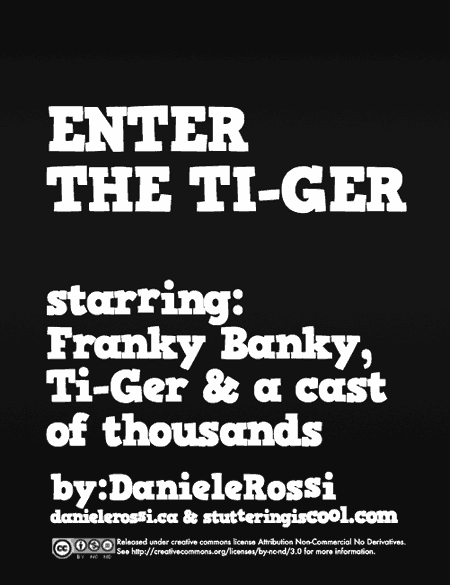 In this comic, Franky Banky shows us his mixed martial arts skills in a UFC style cage match with Ti-Ger, his stuttering! I drew this comic to introduce the Ti-Ger Analogy of Stuttering Acceptance and Empowerment. I don’t get much time to draw as I’d like to so I’m sure you’ve noticed, um… the rustic nature of the artwork is in this comic (but I’m improving). Anyhoo, I had lots of fun working on it and I hope you enjoy reading it. This comic is released under Creative Commons Attribution Non-Commercial No Derivatives. See http://creativecommons.org/licenses/by-nc-nd/3.0 for more information. Click the cover to read or right click to download the 4MB PDF.